A puppy spends most of its first week sleeping. A dog's journey from helpless newborn to playful puppy is short but supremely demanding. An inordinate amount of growth and development is occurring in an incredibly brief amount of time. While it takes weeks for the puppy to be able to stand and walk around, that's still only the beginning. The first two weeks of a puppy's life are called the neonatal period, and it's all about survival. The puppy is born utterly dependent -- unable to see, hear, walk, or even sustain his own body temperature. He does, however, have the sense of smell, as well as the sense of touch, and he'll use both to find and remain near his mother, the source of warmth and food. During this time the puppy spends 10 percent of his time eating and 90 percent of his time sleeping, often twitching, kicking and whimpering as he slumbers in what is called "activated sleep." 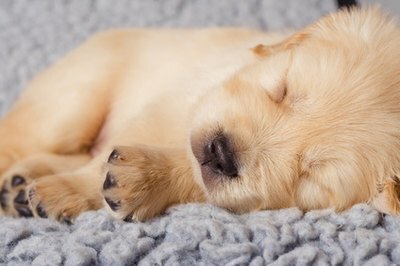 This sleep activity is the newborn puppy's only means of exercise, and it helps his muscles strengthen and develop. The neonatal period continues into week two. The puppy's eyes usually will open during this week, followed by his ears. Many experts recommend that the breeder pet and handle the puppy for at least three to five minutes every day at this point. A puppy that receives gentle human handling tends to have improved cardiovascular performance and disease resistance. He also matures faster, develops better problem-solving skills and is better able to tolerate stress as an adult, according to The Merck Veterinary Manual. The puppy enters a transition period sometime around the beginning of his third week of life. Already able to see and hear, he now is working on his motor skills. This is when the puppy at last will stop crawling on his belly, and begin to stand and walk around. His teeth are starting to erupt, he can lap liquids, and he's gaining control of his elimination processes. He is becoming a typical playful puppy, beginning to wag his tail and play with his littermates. It's important for the responsible breeder to start exposing the puppy to new objects and experiences at this time: the sound of radio and television, a variety of toys, different areas of the house, different flooring surfaces and different people handling him gently. The socialization period lasts from three weeks to as late as 16 weeks, and it is the period many experts feel is the most important time in a dog's life. During this time, the puppy learns what is expected of him, and what rules and behaviors he must follow to be accepted in society. In the puppy's case, however, he must learn the ways of two societies, canine and human. His mother and littermates are teaching him acceptable canine social behavior, and the conscientious breeder is teaching him acceptable behavior among people. He should be kept in a busy area of the house, growing comfortable with the sights, sounds and smells of a typical household. The puppy will want to explore his environment, but he also has the ability now to learn boundaries and simple behavioral responses. Many American breed clubs recommend that a puppy not go to his new home until he's 12 weeks old. This allows more time with his littermates and mother, where lessons in bite inhibition, canine body language and play continue. In the meantime, the breeder will continue working on the puppy's socialization, though once he comes home with you, you'll be responsible for that part of his education. While the socialization period is considered complete at 16 weeks of age, and the puppy’s brain has formed practically all of its neural connections, that doesn't mean you should stop engaging his mind and teaching him of the world. Continue what the responsible breeder and breeding has begun, and help him grow into the happiest, healthiest dog he can be. Dog Owner's Home Veterinary Handbook; Delbert G. Carlson, D.V.M., and James M. Giffin, M.D.